The campaign forms part of a global campaign, called the “Earth Hour City Challenge” by the WWF encouraging cities around the world to tweet on sustainable living. The city with the most tweets, tagged with a dedicated hashtag, by the 27th March will win the competition. To be honest, I’m not really sure what the “prize” is though, except maybe a badge on a website. I’m not going to going into the nitty gritty of the shambles of being paid R500,000 for the social media campaign. Mark Smith has already written a pretty comprehensive in depth look into it. 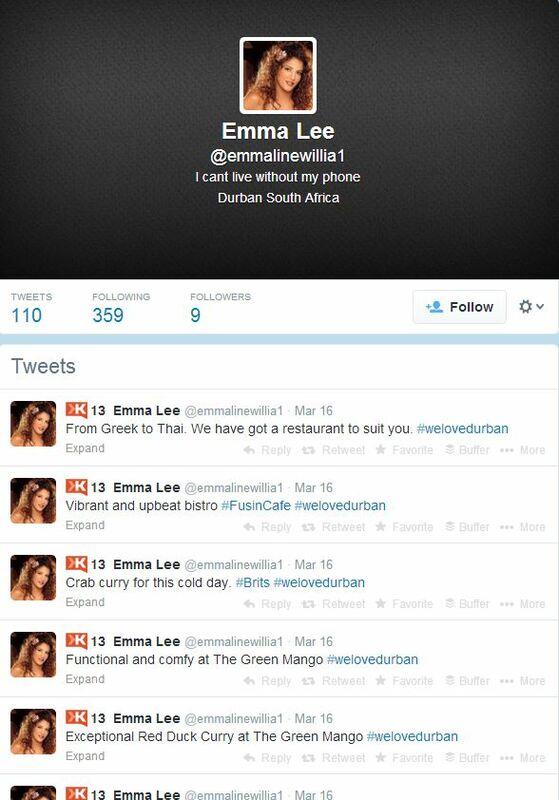 So, if you do a twitter search on the hashtag #WeLoveDurban, I noticed a number of accounts JUST talking about #WeLoveDurban. When going into these accounts, I saw this is ALL they spoke about. 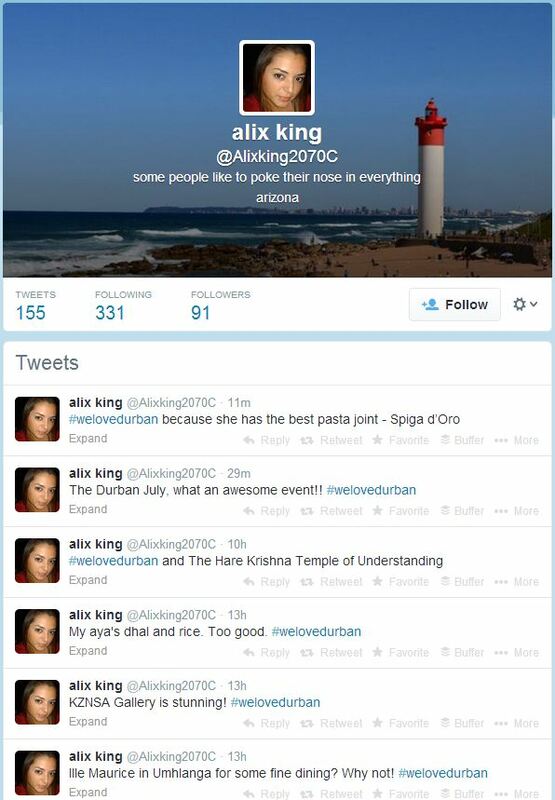 An random example in case is @Alixking2070C, who has posted 155 tweets in 1 WEEK, ALL of them tagged with #WeLoveDurban. Alex King, who lives in Arizona, really LOVES Durban. But she also has 91 followers, and follows 331 people. If we click onto her followers, I see a number of accounts that look rather suspicious. 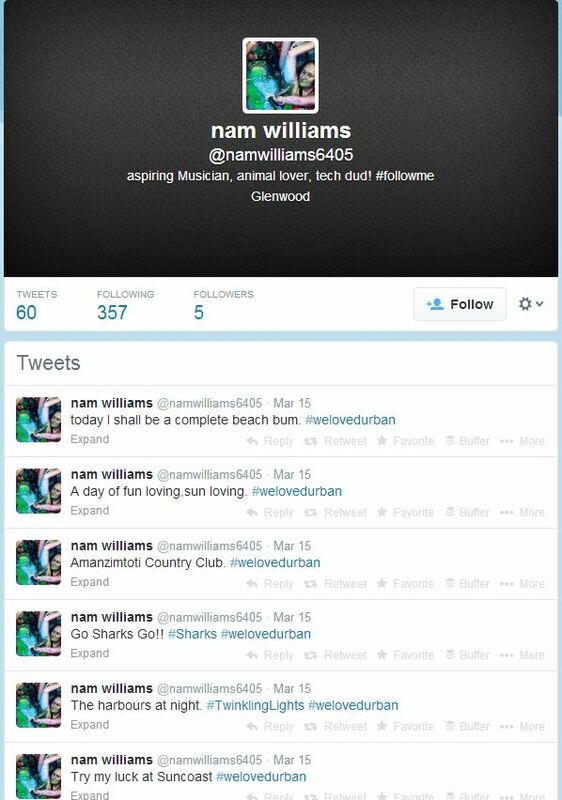 Even though this is a fairly small “sample” of people and accounts, I am confident that the large majority of the tweets for this campaign, for the Durban entries, are fake. I have also heard from a number of people that they too have noticed this dodgy behavior and seen similar activities across the brand. They have also stolen a number of images on Instagram and reposted them themselves, without any accreditation. This is unacceptable for a worldwide competition, which has a global following, and I really trust the WWF, who is behind this competition does some thorough investigation and analysis to ensure that all tweets are legitimate and non fraudulent before announcing the winners! Disclaimer: The above views are my own personal views, and even though I have been contacted (numerous times) by the Agency responsible for this scam, I have declined to take part due to my suspicion around the brand and campaign. Since this post was published earlier today, a number of fake accounts have been deleted. This is proven by the fact that you can no longer any of the above mentioned accounts. As I said above the above accounts were just a sample. 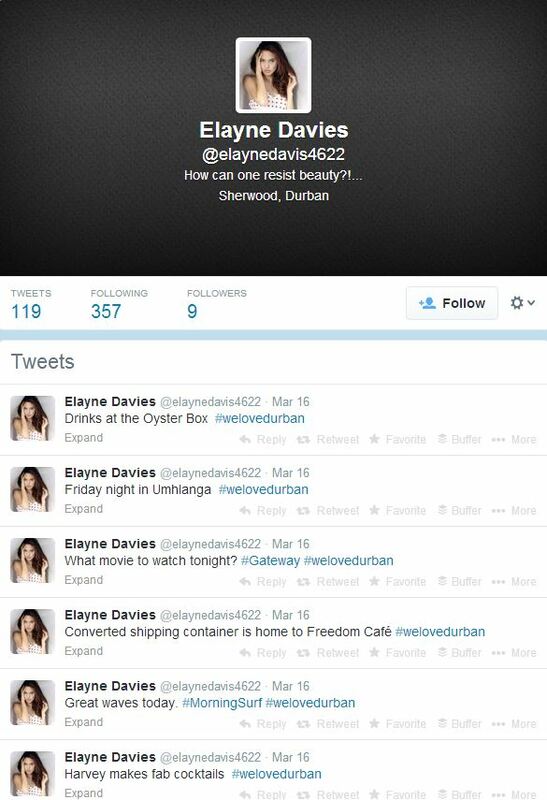 The I Love Durban campaign also posted a blog post earlier denying the allegations of the excessive funds as well as claiming “Cyber-Bullying” tactics which were used in the above blog posts. I wish to state that the post is not intended as a “Cyber Bullying” or defamation post, but merly a post stating some of the facts found from proven research. Unless the above facts are proven to be false, I will stand by my above findings.